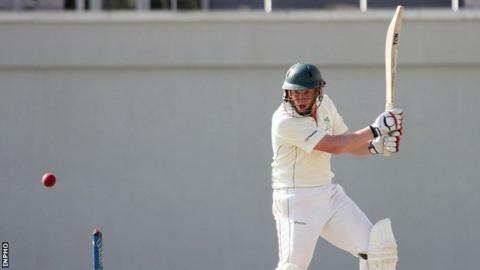 Ireland beat Papua New Guinea by 145 runs in Townsville to move top of the Intercontinental Cup standings. Boyd Rankin took 3-31 in PNG's second innings as Ireland maintained their 100% record to move 14 points ahead of nearest challengers the Netherlands. Their next fixture in the competition is a home match against Hong Kong. Tim Murtagh gave the Irish the perfect start to the final day when he dismissed first-innings centurion Asad Vala (20), who edged behind to a diving Niall O'Brien - one of five dismissals for the keeper. O'Brien now has 50 dismissals in the Intercontinental Cup - eight clear of his nearest challenger, Mohammad Shahzad of Afghanistan. A stubborn sixth-wicket stand of 54 between Sese Bau (45) and Jack Vare (31) held up the Irish victory charge for 27 overs, but their resistance was blown away by Rankin. The giant paceman removed both players, and Norman Vanua, in the space of 16 deliveries to take the Irish to the brink of victory. Spinner George Dockrell took the ninth wicket and John Reva's brief cameo was ended when Murtagh collected an easy catch off the bowling of Craig Young. The Irish now switch their attention to Twenty20 cricket - playing three matches against PNG, starting on Saturday, as their preparations begin for the ICC World Twenty20 in India in March.